Today is Valentine’s Day. I was going to write about the day and how even though it is commercialized, you can still celebrate without all the hoopla. I have never been a big fan myself. I tell my hubs buy me something I will love that you would buy me just because. He usually buys me chocolate covered strawberries and roses. I live the strawberries but feel so bd he spends so much money on flowers. I always tell him to buy me daisies because they are my favorite. This year he listened and didn’t get me roses. He bought me some beautiful tulips. Another flower I love. I also said a few weeks ago I wanted bath stuff so I could indulge in our big master bath. So he had some super yummy bath crystals, bubble bath and stuff that is made with citrus from California. If you have been to Disneyland California Adventure there is this ride called soaring over California. When you go over the orange trees there is this amazing citrus scent in the air- this is what the bath stuff smells like. I love that ride. We will go to dinner but not anything fancy. Just a night off from the scheduled events at our house like bathtub and a story before bed. I will give my boys tons of kisses and let them have some chocolate. They are staying with my parents over night so, haha mom! I will miss them and I’m sure at some point we will talk about them over dinner. Valentines day is what you make of it. I only expect to spend time with my boys . I only require my hubs to feed me. My gift to my hubs is his awesome token necklace hand stamped: schmoopy my one and only. I ordered it off ertsy from szetobaby. I also made chocolate covered strawberry cake balls. This year my gift to Aiden is this cute lunch. And well Caleb gets extra kisses and hugs. Most importantly tell those you love that you do and how much they mean to you. Happy Valentines Day! 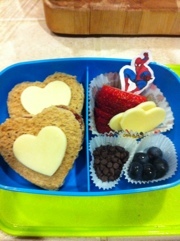 This entry was posted in KiddieTalk, MommyTalk and tagged bento lunch, preschool lunches, valentines day. Bookmark the permalink.